I’ve noticed that many of the quotes to which I am drawn employ parallelism in some form. The structure seems to make them more accessible, logical, and memorable. The first word that often comes to my mind is “brilliant!”—so simple and yet incredibly profound. Parallel structure also tends to distill a quote down to the basics and eliminate extraneous or distracting words and ideas. It reinforces the idea that a tight form requires a precision of ideas while counter-intuitively increasing creative thought process (hello, poetry!). I’ve thought more deeply about these two quotes than almost anything else I’ve read recently. But not as deeply as I could think about them if I decided to use the 5 Common Topics. How are the two quotes similar in structure? Different? They both use parallel structure. They are both similar in length. They both contain two independent clauses (the clauses in the first quote are connected by a semicolon, the second quote is expressed in two sentences). They both use antitheses (contrasting opposite ideas: others/ourselves, rhetoric/poetry and justice/mercy, grammar/poetry). 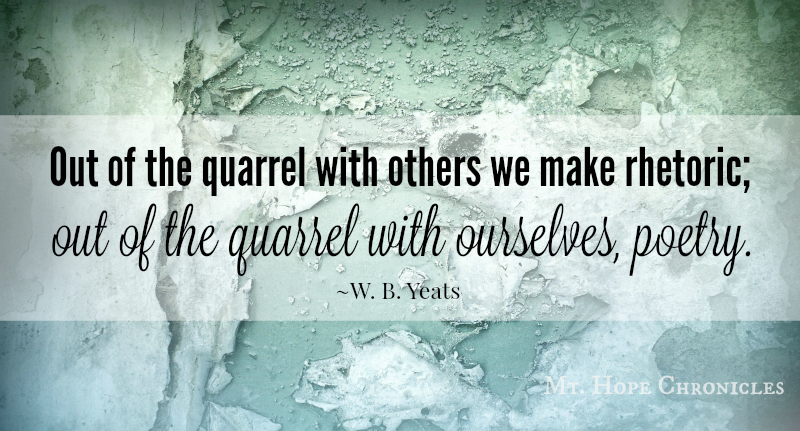 The first quote uses anaphora (repetition of words at the beginning of phrases, clauses, or sentences: “out of the quarrel”). The second quote uses epistrophe (repetition of words at the end of phrases, clauses, or sentences: “of things”). Anaphora and epistrophe are similar (repeating words), and yet opposite (beginning and end). The first quote contains an action verb (make). The second quote uses a linking verb (is) to create metaphors. How are the ideas similar? How are they different? They both say something about the nature of poetry. The first concerns the origin or impetus of poetry. The second addresses a quality of poetry by use of metaphor? They both express contrast and relationship of ideas. Both of these quotes are specifically addressing the relationship of things. How is justice related to mercy? How is grammar related to poetry? How is rhetoric related to poetry? How are we ourselves related to others? Which came first? Is one dependent upon the other? Does one cause the other? What was the circumstance or context in which each quote was written? The Cross says something like the same thing on a scale so cosmic and full of mystery that it is hard to grasp. As it represents what one way or another human beings are always doing to each other, the death of that innocent man convicts us as a race and we deserve the grim world that over the centuries we have made for ourselves. As it represents what one way or another we are always doing not so much to God above us somewhere as to God within us and among us everywhere, we deserve the very godlessness we have brought down on our own heads. That is the justice of things. But the Cross also represents the fact that goodness is present even in grimness and God even in godlessness. That is why it has become the symbol not of our darkest hopelessness but of our brightest hope. That is the mercy of things. Granted who we are, perhaps we could have seen it no other way. According to biographies of William Butler Yeats (and here), he seemed to wrestle at great lengths with his ideas about religion at least, and he was an acclaimed poet. The quote is found in “Anima Hominis.” I won’t claim to understand anything about it, but I found the following excerpt from this analysis fascinating. What other things were happening or being said about the ideas at the same time? What do the authors of the quotes have in common? Differences? Both men. Both alive in the years 1926-1939. Both acclaimed writers. Both spent time contemplating theological ideas. Buechner—American novelist and theologian (wrote fiction and non-fiction), Presbyterian minister, born in 1926, still living, finalist for the Pulitzer Prize in 1981. Yeats—Irish poet, 1865-1939, awarded Nobel Prize for Literature, born into Irish Protestant family but seemed to wrestle at great lengths with his ideas about religion, eventually joining a new group called "The Esoteric Order of the Golden Dawn" which incorporated astrology and traditional European Cabalistic Magic. 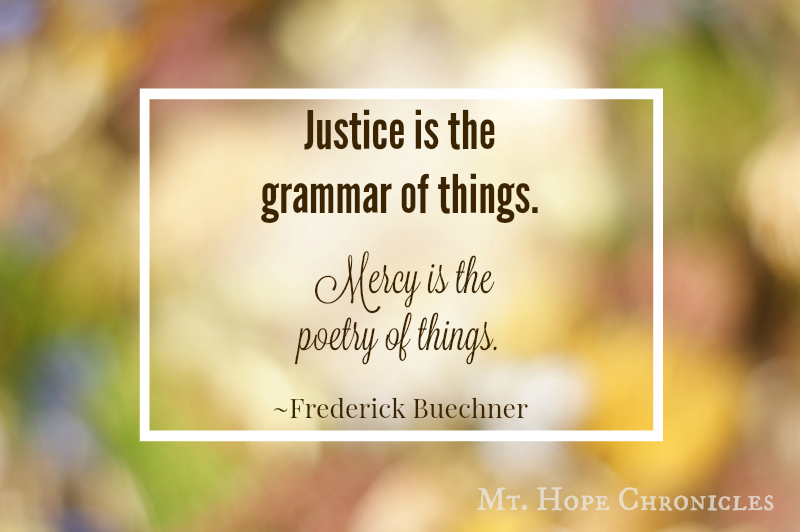 Who else has something to say about justice and mercy? The Lord works vindication and justice for all who are oppressed. The Lord is merciful and gracious, slow to anger and abounding in steadfast love. Aristotle? The author of both Rhetoric and Poetics. N.D. Wilson and Douglas Wilson in The Rhetoric Companion? Who or what is popularly considered an authority and why? Do you agree? Now that we’ve reviewed the 5 Common Topics, we’ll move from dialectic to rhetoric in the next post. You've made me start off my Monday morning (and my week) with deep and lovely ideas to contemplate. I so appreciate the work you put into modeling and sharing the asking of great questions! Thank you, friend! Freezing here in GA this a.m. savoring a blissfully cold, fireside morning. Wishing you the same.